Sacrifices must be made-blood for blood... life for life... hearts for scarred hearts. Raised as a prototype for the Georgian Bratva's obedience drug, 221 fails to think, act or live for himself; his master's perfectly-crafted killing puppet. Standing at six foot six, weighing two-hundred and fifty pounds, and unrivaled in to-the-death combat, 221 successfully secures business for, the Georgian Mafia Boss of NYC, in the dark world of the criminal underground. Until his enemies capture him. Talia Tolstoi dreams to break from the heavy clutches of Bratva life and dreams of another life-away from the stifling leash of her father, from the brutality of her work at The Dungeon-her criminal family's underground death match enterprise. But when she stumbles upon her family's captive who is more monster than man, she starts to see the man underneath. A powerful, beautiful, damaged man whose heart calls to hers. I wasn't really sure what to expect with this book. I'm a massive fan of the Hades Hangmen series and so picked up the first book in this series, Raze, by chance and thoroughly enjoyed it. 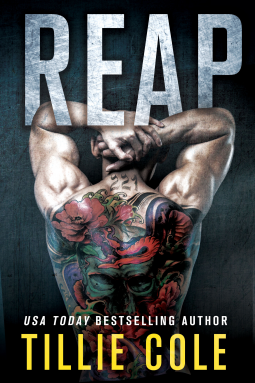 So, when I heard Reap was coming out I had to get my hands on it and see what else was happening in the world of the New York mafia. My heart strings were seriously pulled in this book. Maybe even more so than Raze. Initially Talia Tolstaia was a little irritating but that really didn't last for long because when you recognise the one for you, nothing else matters and I really did feel for her. I could beat Mrs Cole with a stick for the ending. My curiosity is seriously peaked for the next installment!